Now that’s one cool sky !! Amazing shot. Beautiful details. I really like the processing. Beautiful architecture! Great work my friend. Have a wonderful weekend !! Beautiful detail in this historic building! Great work, as usual, my friend!! Gorgeous capture of America’s Capitol Building & wonderful processing too! enjoy your weekend, Bill! Non è giusto né bello, ma mi affascina il tuo cielo così drammatico…. più dell’arte da te ripresa, perdonami! Amazing lights!! love the sky! Beautiful processing. Great details and wicked clouds. Have a nice weekend Bill. We have rain in Montreal. Wowza, that sky is perfect for this shot….amazing work as usual Bill! Stunning this tympanum ,great shot and find !!! El cielo es escandalosamente bello,realmente impresionante amigo,enhorabuena. Fantastic shot Bill… Have a great evening. Fabulous image very impressive my friend. Very beautiful image and processing, Bill. Remarkable capture, splendid light and compo! Great shot and clouds, Bill. Have a nice Sunday. Beautiful composition my friend with exquisite detail and the dramatic sky is stunning !! 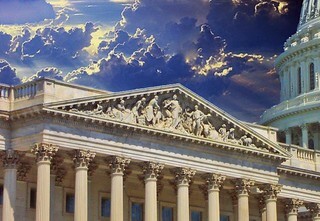 Excellent image of this beautiful detail of the Greek style building and the dramatic sky of the scene. Impressive work with the sky ! Beautiful detail of this lovely old historical building and I love the sky and light..
Enchanting work! Great subject Historic Building and Interesting information. Best regards Bill. Excellent shot and superb processing. Excellent image, well done. I like this shot !! Stunning clouds make for a very dramatic capture ! Superb details and very beautiful architecture! Excellent POV and view your sky treatment makes the image a stunner, have a good evening my friend. Beautiful details of the building and an excellent composition. An image of biblical proportions! That’s some superb work my friend, the composition and processing are always impressive Bill, have a great evening ! Excellent shot my friend !! Very awesome sky and shot, Bill!! Stunning image with that dramatic sky Bill, nice work. Amazing processing, Bill !! Fantastic sky! Fantastic sky behind these awesome and detailed buildings, dear Bill. Stunning composition ! Have a great Sunday , Bill ! That’s really a fine capture. Awesome PoV and sky and too "crazy" colours, Bill!!! great historical architecture of America. Excellent shot and terrific detail. Wow! fantastic masterpiece, Bill! very beautiful architectural composition and details! absolutely amazing sky! Bravo! Fantastic light and the sky is awesome! Like in the ancient greece times the gods are not happy. Beautiful shot. Great sky and other building add to this. Excellent work my friend !!! Excelente trabajo amigo, felicidades !!! Lovely shot, well done !!! Wishing you a lovely week !!! Te deseo una semana adorable !!! Gracias por visitar mi galería !!! This should be seen on Large, Bill, where one can fully appreciate the excellent detail of that famous pantheon. Have a great new week, good friend !